So, that ends “Needlemouse Week” here at TSS. Thank you to you readers as well for sitting through our week of fake reveals. I hope that you enjoyed them. It looks like my initial prediction was correct. Let’s celebrate my completely insignificant and easily guessable achievement! PARTY. Thanks to ila of SFGHQ for keeping the Evil spirit alive. Don’t know Evil? You need to watch more old school Sonic Show (27:50 mark). Thanks again to Trunks for providing us with a week of reveals. The week long Needlemouse challenge speeds into it’s fourth and final day with one last quest for the Sonic Community to complete. This time the battleground is on Twitter. Oh, and bad luck to any Amy and Shade fans as they became the most recent Sonic characters to be rejected as playable characters. Once again, RubyEclipse from the SEGA America Blog was on hand to give us the down-low on our challenge. Final Goal: Reply @SEGA on Twitter with a total of 1,000 correct answers! 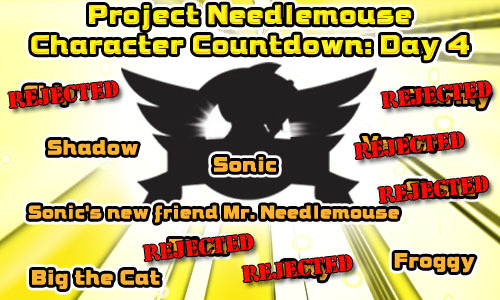 Bonus Point Earned if correct replies break 1,250 responses, ORif #SEGA or #Needlemouse become trending topics! How to create trending topics:Trending Topics on twitter are words or phrases that are the most frequently written. Put a # just before the word (ex: #SEGA) to contribute to a it’s rank. You can keep on talking to your friends and updating with #Needlemouse or #SEGA, and you will continue to raise the chance that they become trending topics on the front page of twitter! 1: If you locked Sonic 3 onto Sonic and Knuckles, what was the largest amount of emeralds you could collect from special stages? 2: Yuji Naka is credited with much of Sonic’s history, but who is the man that actually designed Sonic? 3: During his creation, what was the Japanese name originally given to Sonic? This is it, everyone! The final chance to get that last bonus point, and the day for us to show the world that the power of fans can accomplish amazing things. The contest ends in 24 hours – let’s roll! The questions are harder, the answers needed higher but it can be done. If you’re not a member of Twitter it’s easy enough to sign up and now is the perfect time to join. It might also be an idea to ask friends and family to help out if need be, we’ve done so well it would be a shame to fall at the final hurdle. Good luck all.